After releasing the “prototype” Chromebook Pixel earlier this year, Google has gone the opposite way for the mass market with the lightweight, low-powered Chromebook 11 from HP. 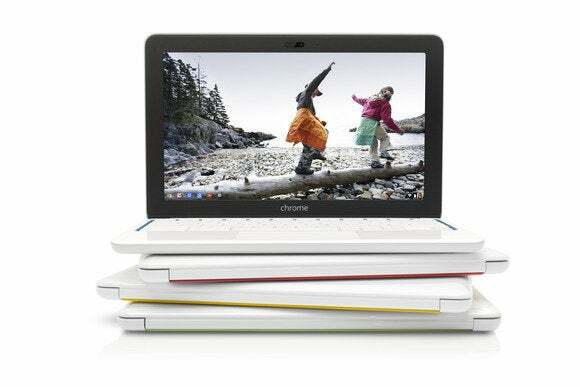 Google and HP collaborated on the design of the new Chromebook, which ships this week for $279. It is essentially a successor to last year’s $250 Chromebook from Samsung, with the same ARM-based Exynos 5250 processor, 2GB of RAM, 16GB of storage and two USB ports. Both the old and new laptops have 11-inch displays, each with a resolution of 1366 by 768 pixels. The improvements in the Chromebook 11 are all about design and fine-tuning. Google says this new Chromebook has a sturdier magnesium frame, so it won’t flex when you hold it up from one corner, and it manages to be a tenth of a pound lighter than the Samsung Chromebook, weighing in at just 2.3 pounds. The new Chromebook 11 comes in black or white. Although the screen resolution is unchanged, the display has 176-degree viewing angles. Google also claims that the Chromebook’s speakers are “finely tuned,” and placed under the keyboard so the sound projects toward the user. In other words, Google and HP are addressing some of the major weak points of the Samsung Chromebook, which was flimsy—you could actually click the trackpad by pressing from underneath the bottom edge—and had horrible viewing angles. In another nice touch, the new Chromebook charges via micro-USB, so Android phone or tablet users don’t have to carry a separate charger. While those are nice improvements, it’s too bad the tech specs are unchanged from last year’s model. In my experience, the Samsung Chromebook struggles to keep up with lots of open browser tabs and lengthy online documents. There’s also no official word on an availability of an LTE model. We’ll have to see how the new Chromebook 11 performs in the real world, but it’s unlikely to work miracles for $279. If you don’t mind browser-based computing but need more power, you should hold out for Chromebooks with Intel Haswell processors that are expected later this year.